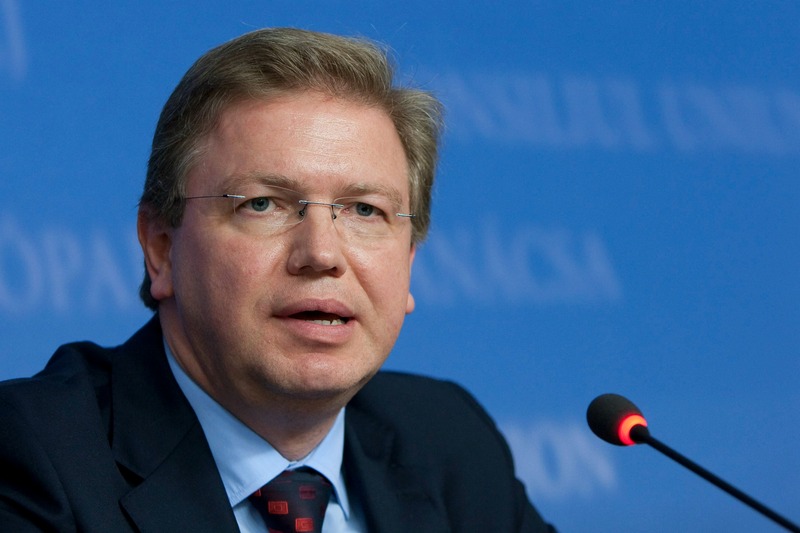 Štefan Füle is the European commissioner in charge of enlargement and neighbourhood policy. He spoke to EURACTIV Czech Republic’s Chief Editor Lucie Bednárová and Jan Pavec. The original text in Czech can be found here. How do you personally feel about the situation in eastern Ukraine? It is appalling. When I see people dying just because the politicians in Ukraine and Russia did not manage the situation, I feel very sad. What could the EU have done better? There are not many things we could have done better. It was not the European Union who brought the disappointment. It all began with one-sided steps taken by Russia, which intended to suppress Ukraine’s own sovereign decision about its relations with the EU and with Russia. The Maidan in Kyiv arose to support the pro-EU direction. It was the then-Ukrainian President [Viktor Yanukovich] who did not manage to communicate with his own people. It was the Ukrainians themselves, who used a totally disproportionate force against the demonstration in Kyiv and provoked radicalization on both sides. Here then comes the Kremlin propaganda, starting to present the whole development as a fascist coup – a notion which finds a lot of room and understanding in Russia and all other places inhabited by a (large) Russian community. Crimea was annexed by Russia after a “referendum” which was accompanied by billboards showing a map of Crimea with a Russian tricolour on the one side and with a Nazis symbol on the other side. I can only add one thing: the EU will never accept the annexation of Crimea by the Russian Federation, and we will always support the territorial integrity of Ukraine. There are critics who point out that the EU created too many expectations for Ukrainians, which could not have been fulfilled, and that the EU is talking about future EU membership for Ukraine. But it is precisely the other way round. Over the past years, it was Ukraine, including the former President Yanukovich, who demanded all the time that there should be a mention of Ukraine’s European perspective in the text of Association Agreement. But that did not happen, because the member states did not find agreement on that. Is there still a space for dialogue with Russia, concerning the impact of the association treaty between Ukraine and the EU? There is a space. The dialogue is ongoing, and we have always been ready to hold these talks. At the beginning of last year, the European Commission held a joint session with the Russian government in Moscow. We explained the philosophy of the Eastern Partnership, the issue of the Association Agreement, the Customs Union, and our view of the future relationship between the EU and the Eurasian Union, which is in the making right now. We have offered Russia further discussions on these matters, but Prime Minister Medvedev did not react at all. Russia did not react to our repeated reminders about our readiness for this dialogue, either. Only a few days before the EU-Russia summit last November, the Russians came to Brussels to negotiate about the relationship between the Association Agreement and the Customs Union. At the end of January, when the last EU-Russia summit took place, the President of European Commission, Barroso, and the President of European Council, Van Rompuy, offered President Putin to create an EU-Russia working group, which would focus on Russian concerns about the alleged negative impacts of the Association Agreement on Russia. We had many facts and arguments to show that such concerns were unsubstantiated. There have been already two meetings of this group, and we are ready to continue. It is useful to talk about these issues. It forces our partners to present factual arguments, and not political statements. With experts, you are able to agree on the fact that the white colour is white and the black colour is black. But even they themselves admit that there is a political line in Russia which does not always allow them to say that the white colour is indeed white. What can the Ukrainians, Georgians and Moldovans expect after they sign the Association Agreements at the upcoming summit? What will be the practical impact of the treaties? (An) Association Agreement is an agreement about reforms. It is a proposal of the way how the EU partners can get closer to the EU and become a part of the EU in an economic sense – after implementing a considerable part of the EU’s know-how. The signature means that the EU was able to deliver on its promises to the partner countries which were related to the Association Agreement. The political support for this is unquestionable. Before the ratification, a provisional application of the agreements will take place. During this process, approximately 90% of the treaty’s content falling under the authority of the European Commission and the European Parliament will be implemented. The ratification in the EU member states will take place simultaneously. Ukraine can already take the advantage of so called autonomous trade measures. Ukrainian exporters who sell their products in the EU do not have to pay custom duties until 1 November 2014. As soon as the Association Agreements are signed, none of the three countries will have to pay these tariffs. This will apply to European exporters on the other hand, as well. The agreement is asymmetric. On the European side, the market will be fully opened with only few exceptions. The three partner countries, however, can keep transitional protective periods for areas where they need a longer time for adaptation for conditions of European market. Talking about Ukraine, in some cases, there will be a 15 year-long protective period. The Russian company Gazprom stopped gas deliveries to Ukraine last week. What is the EU going to do next? My colleague [Energy] commissioner Günther Oettinger is preparing bilateral negotiations with Ukrainian and Russian partners, and next month, and is planning to invite them to trilateral negotiations. They are going to talk about the issues where there seems to be a huge gap between Kyiv and Moscow about how to solve the situation. We are of course aware that there is a certain amount of time before the winter season comes. On the other side, we know that with empty gas storage, without Russian gas, the situation can get worse for EU member states. That is why we do not want to wait for Moscow or Kyiv. We want to address them actively, again. Where do you exactly see the potential for agreement? Ukraine wants a new contract for gas deliveries, where the prices are the same as the commercial prices at the European market. The contract signed in 2009 contains several non-standard parts. Above all, it is the condition called “take or pay”, which means that Ukraine has to pay certain volume of gas even when the country does not take the whole amount. And the prices are much higher than the commercial prices in the EU. Russia solved it back then with a political “discount”. Every other thing can be discussed. Concerning the price, both sides are not that far apart in their opinions. Concerning the obligations, Ukraine has declared that it is ready to fulfill all of them. The country wants to pay the bill in installments, but only after the agreement about the price has been reached. Russia wants to maintain the current contract, wants a higher price of gas, and at first repayment of the debt. Afterwards, it is willing to (talk) further. The European Commission is prepared to do everything we can to get Moscow and Kyiv closer together, by means of bilateral, but also trilateral negotiations, in order to not endanger the safety of energy security in Ukraine and in EU member states, and to increase the credibility of the gas transit system of Ukraine. You are dealing with enlargement in the European Commission. What has changed in this area during last five years? A lot of things. Both member states and candidate countries got tired by the slowly proceeding enlargement process. Above all, the last enlargement of Romania and Bulgaria brought a lot of questions about the credibility of the whole process. Because it was the first time that the EU decided to establish a special cooperation and verification mechanism on existing member states. The biggest challenge was to return the lost credibility to the enlargement process. It forces us to expand and tighten benchmarks. Candidate states should prove that the adopted legislation is working. Before I started working in the European Commission, member states had just a few tools to influence, or even stop, the enlargement. Now they have more than 100 possibilities to do it. We do not want to slow down the process in any way. But every member state now has more possibilities to oversee good quality preparations of the candidate countries. Another step forward is the economic integration of candidate countries. We prepared something similar to the European semester. We were focusing on growth and employment, only after the country became a member state in the past. Now we are engaging and helping them to make structural reforms, to bring them closer to the EU at the beginning of the process. The enlargement is not about ticking off boxes. It is a process of real change and transformation. In the European semester, the European Commission analyzes the fiscal and structural reform policies of every member state and provides them with recommendations. But they are still recommendations, so it means it is up to every country to decide to follow them. I guess it would be the same with candidates. Is it effective? Yes, you are right, but at the same time, the EU member states already have obligations stemming from existing instruments where there is also a sanction mechanism included. Concerning candidates, it is something different, of course. You can push them for something only after they accepted common rules and became full members of the EU. On the other side, they know our recommendations are connected with funding. If the country refuses to make reforms in a particular area, we can redirect a significant amount of money to another country willing to do it. It is based on presumption that the country wants to become an EU member state, and it is willing to work on it. Member states have much more possibilities for controlling the enlargement process than in the past. It could bring complications too. You recommended the candidate status of Albania a couple of weeks ago, but some member states decided to bloc it, including the Czech Republic over a dispute between Tirana and [Czech utility] ?EZ. I agree, it is more complicated and more demanding for everybody. But at the same time, I am convinced that it is the only right way to move forward. The enlargement should continue to be a political process. It is not on autopilot. The enlargement is not about adding one more chair to the negotiating table at the European Council, or a flag in front of the European Parliament. It is above all about the strengthening the EU. The enlargement is not an import of unsolved problems into the EU. Does it mean you accepted all the objections of the Czech Republic? Let’s be careful and not mix two things together. We take all the objections of all member states very seriously. After we recommended the candidate status for Albania last year, the member states asked to prepare a report about the reforms in this country, specifically related to the fight against corruption and organised crime. We submitted this report at the beginning of June, and stated that Albania had made significant progress. It means Albania has fulfilled all the obligations agreed by the member states. The logical step afterward is granting the candidate status. The ministers approved it on Tuesday, in Luxembourg. I would like note that the “take or pay” clause in long-term gas supply contracts is commonly-used, standard, provision, which is a reflection of the specific characteristics of the gas industry. Therefore, stating that that “condition” is “non-standard” shows that one is either ignorant or fabulist. I believe that Mr Füle is not ignorant since he is a very well educated person. The mechanism for cooperation and verification itself is failing in the situation of Bulgaria and Romania. What incentive is there to carry on with counterproductive measures? Since the sought progress (at least in Bulgaria) is virtually non-existent, the obvious conclusion should be that the mechanism is not working and another approach should be taken. And if one puts it under closer scrutiny, its discriminatory nature would become as evident as the light of day. Why subject Bulgaria and Romania to conditions that have produced less than the minimum results anticipated but not Croatia? The explanation is fairly simple – we should not have been allowed to join the EU in the first place since neither country actually fulfilled the economic criteria. “…There are not many things we could have done better.”…, Bla, bla, Romania and Bulgaria… bla, bla. You just did everything right, but Romania and Bulgaria are the usual bad apples. That’s breaking news ! By the way, just recently two buildings collapsed in India killing several people. I think is Romania and Bulgaria’s fault too… Isn’t that so Mr. Full(e) ? Štefan Füle (a Moscow-educated clerk and a 19-year-old member of the Communist Party of Czechoslovakia) is certainly the best example for an established careerist on top of EU. No Bulgaria and Romania compromised the enlargement process but the crazy statements of Füle himself about the Ukraine’s fast-track accession to EU! Shame on EU for leaders as Füle!